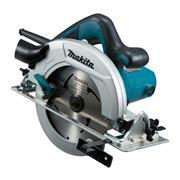 This guide will walk you through how to pick the right circular saw for your needs. We'll consider what you need to cut, where it is you’ll be working, and what kind of blade you need to select. Let’s be honest – personal brand preference is going to be a major influence for many consumers. 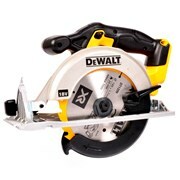 You may prefer Dewalt, Makita or Milwaukee; they’re all professional brands if we stock them. Batteries are usually universal within the same brand and range, so if you’ve already got Makita cordless tools you’ll want a Makita saw. If you’re going for a corded tool, though, there’s nothing to stop you comparing all the brands. So long as it meets your specifications, go for a brand you’re comfortable with. 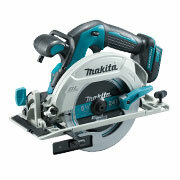 The first question you need to ask yourself is whether you would prefer cordless or corded. With a cordless saw you don’t need to have wires trailing around or rely on a transformer, but you are dependent on the battery holding out. 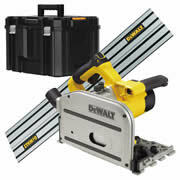 If you are intending to use the tool in a fixed location like your own workshop, a corded saw could be adequate. 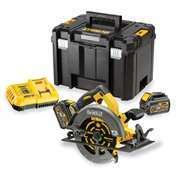 Circular saws (or rip saws) are among the most battery hungry machines. If you're a heavy duty user, you should consider the expense of high capacity batteries with a cordless option (remember: the higher the aH, the longer the battery life.) If you invest in a larger battery, it's an upgrade for all your cordless tools. With most brands the batteries are interchangeable. 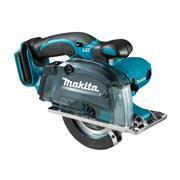 You can take an 18v battery out of, for example, a Makita DHR242 SDS+, and use it in your DHS680 circular saw. 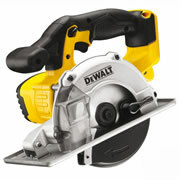 Not only is the cordless saw more flexible, buying body only options in the future creates a saving. A saw’s cutting capacity just means how deep it can cut through any given material, so you need to make sure that your saw’s depth of cut meets your needs. The bigger the saw blade, the deeper the cut. The bevel capacity, meanwhile, refers to your saw’s ability to tilt the base plate to cut at an angle. 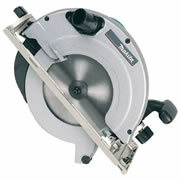 Many circular saws allow the capacity to cut at an angle, allowing you to make diagonal cuts into your material. 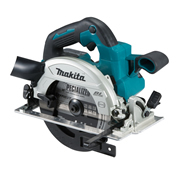 Keep in mind that the angle of your saw affects the depth of cut; for example, the Makita DHS680 has a capacity of 57mm at 90° (in other words, when it is upright) and a depth of 41mm when cutting at a 45°angle. The maximum cutting capacity and angle of cut is listed for each saw on our website, so be sure to check it’s sufficient for the job. Within each brand there are a range of motors. The tougher the material you’re cutting, the bigger the motor you’re going to want. If you’re ripping rough cuts in timber, you’ll want a big motor. If you’re working with softer materials, a lower watt motor will be sufficient. 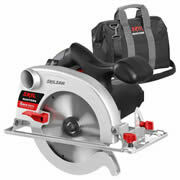 A higher watt motor also means you should get a higher RPM from your saw, thus a cleaner cut and greater control. This often comes down to a first fix vs second fix divide. 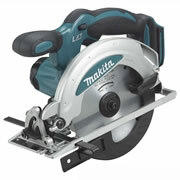 If you're working in finishes then you'll appreciate the lighter, smaller motor and machine. The bigger motor (and often price!) are requirements for those of you in first fix. The wattage isn’t the be all and end all, though; what’s more important is having an appropriate blade. Selecting the right rip saw is important, but it’s equally important to make sure the blade fits your tool and the task you’re setting it to. You’ll need to check the saw’s bore and blade diameter, as picking a blade that doesn’t fit will affect the guard and can be a serious safety concern. A rougher material will necessitate a coarse blade, but for more delicate materials (like laminate or veneer board) you’ll want a fine blade. The more teeth a blade has, the finer a cut it will give. 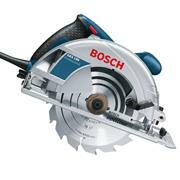 You can also get specialist blades designed for plastic, aluminium, sheet steel, and nail-embedded wood. As mentioned above, so long as the bore and the diameter fit your tool, you’ll be able to find a blade in our selection to meet any of your needs. Accessories – what do I need? 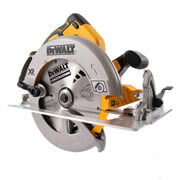 If you’re in the market for a circular saw, you probably know that there are accessories you’re going to need to make the most of your new tool. To start with, clamps are important to keep what you’re cutting still and thus allow for straighter cuts. There are several varieties, including screw clamps and the faster to apply KliKlamp. Dust extractors are also a must in many situations – make sure that the extractor you’re buying is compatible with the saw you’re using and also meets the legal requirements where you’re working, as many sites now require an ‘M’ class extractor. With a dust extractor, you’ll have practically no clean up time after your job, making everything much quicker and easier. 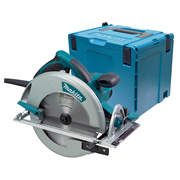 Certain circular saws (and plunge saws, see below) can be fitted with a rail – this allows for precision cuts through your material, even at an angle, to allow for work that is quick, simple, and accurate. Many rails come with a splinter guard, too, which means that you can cut through your material at a high speed while preventing the timber from splintering and splitting. Splinter guides will eventually need to be replaced. You can easily attach a guide fence to your saw to fit it to the rail for more accurate cuts, then detach the rail again in situations where it’s unnecessary or too cumbersome. Depending on what kind of work you’re doing, a plunge saw may actually be more appropriate – they’re increasingly popular and very versatile. A plunge saw allows the saw to ‘plunge’ into the material, easily setting the depth of cut and the angle, giving a far more compact and convenient solution to the kind of work you’d traditionally do with a table saw. Tracks can be connected using connector pieces, too, allowing for accurate cuts through longer materials like kitchen worktops. 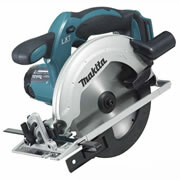 There is no real “best” circular saw, but using this guide you can find the criteria for picking the right one for you. We’ve provided the spec for every saw on our site, and you can use the side bar to filter by blade size, price, and wattage. Remember – second fix users can make the best use of a lower watt, smaller saw, while those in first fix will need to get something bigger. Don’t forget to check our blades to make sure you’re going to make the best use of your saw, and pick up some accessories to make things speedy and efficient. If you need any further advice, you can call us 08:00-20:00 Monday-to-Friday and 08:00-17:00 on Saturday, or you can chat with one of our tool experts online.